Dvorin and Engel Menendez, third and fourth from the left; in front of Engel Menendez is her son, Cole; Bershad, far right. PPRA members, Catherine Engel Menendez, Adam Dvorin, and Robert Bershad, along with family and friends recently volunteered at The Lutheran Settlement House (LSH). Volunteer efforts involved the regrading of a plot of land that the Lutheran Settlement House will soon turn into a park. Thanks to the hard work of volunteers the plot of land that was once uneven and not conducive for planting, now has a smooth, slight grade that is ideal for seeding and growing. 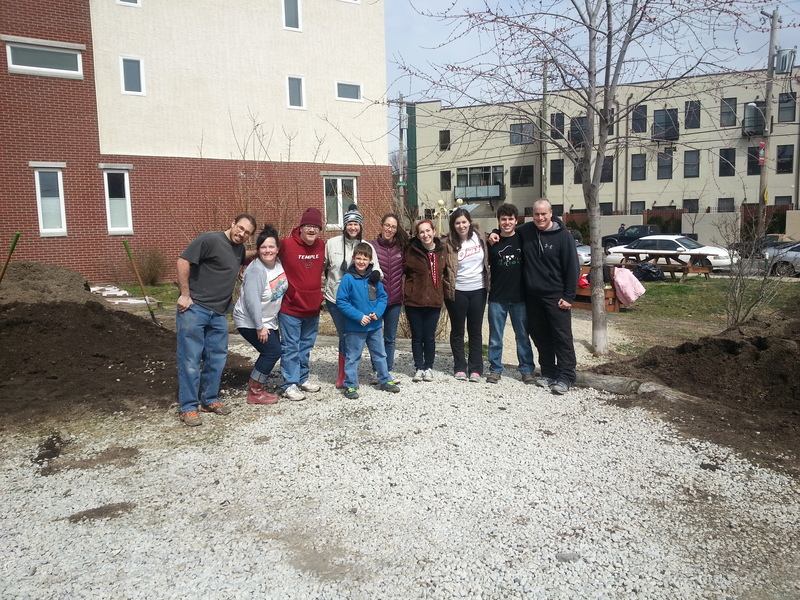 Volunteers used shovels, wheelbarrows, and rakes to move and tamp down two large piles of soil into a nearby park plot. They also prepared flower beds. The effort, which took about three hours, saved the LSH $6,000 in labor costs. PPRA participated through the PPRA Community Service Committee, chaired by Robert Bershad. The activity was planned in collaboration with LSH’s activities coordinator and urban farmer, Jesse Bilger. “PPRA put in a great volunteer effort that went far beyond what I expected. Many hands make light work and that’s never been more true than when PPRA moved earth for the Lutheran Settlement House,” said Bilger. The urban farm where volunteers worked spans across land that was at one time four row home lots. 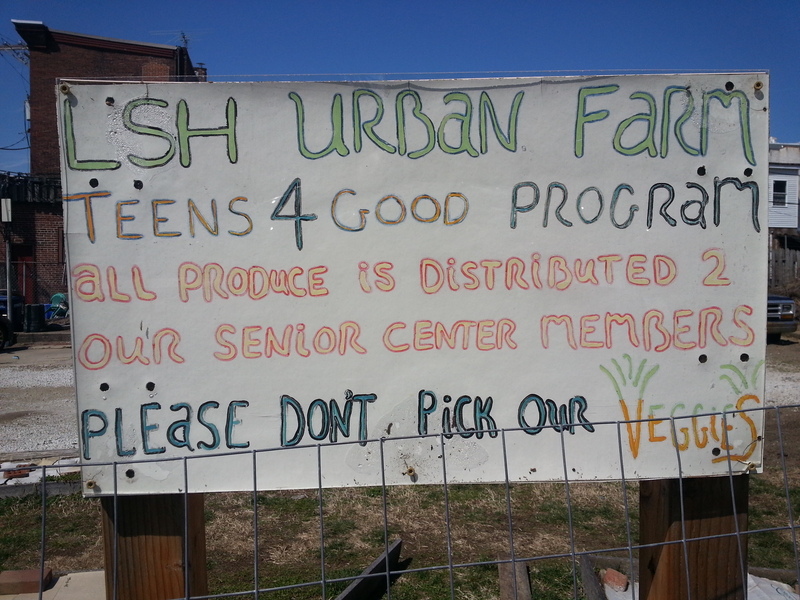 The farm produces thirty kinds of vegetables that are all donated to LSH’s senior center meal program. The Lutheran Settlement House, located in Philadelphia’s Fishtown neighborhood, empowers “individuals, families, and communities to achieve and maintain self-sufficiency through an integrated program of social, educational, and advocacy services.” Their programs include a senior center, transitional housing and counseling, teen after school activities, adult literacy classes, and a food pantry. Are you interested in participating in one of our upcoming volunteer opportunities? Join us on Saturday, May 2, from 12 pm to 3 pm, as we assist the Norris Square Neighborhood Project (NSNP) with their spring cleaning efforts. The NSNP “promotes positive change through youth education, community leadership, green spaces, the arts and the celebration of Latino culture.” Let’s work together to clear out-of-date children’s after-school games and activities from the basement of their headquarters, which is located at 2141 N. Howard Street. This activity includes lifting and carrying assorted items of varying weight and a flight of stairs. Please RSVP to the PPRA Office at info@ppra.net. We look forward to seeing you there! This entry was posted in Events, Message for Members and tagged Community, Community Service, Giving, Greater Philadelphia, Leadership, Philadelphia, PPRA, Public Relations, Volunteer, Volunteering by pprablog. Bookmark the permalink.